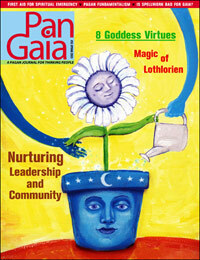 PanGaia #35 Leadership & Community (paper) [pg035p] - $9.95 : BBI Media - Magazines that feed your soul. In this issue, our contributors share their thoughts on leadership, community, and the complex interaction of the two. In our lead article, “A Path Beyond Grasping: Reflections on Conflict and Ego in Pagan Spiritual Groups,” Frank MacEowen discusses the functions — and dysfunctions — of community. Judy Harrow brings us a great deal of experience both as a Pagan and a counselor in “The Fool on the Hill: Dealing with Spiritual Emergencies.” This article explains the nature of a spiritual emergency and how it differs from a mundane mental illness. It suggests what to do should someone in this type of distress seek your aid, and also suggests when to refer them to professional help. Don’t let the whimsical title fool you; “The Holy Order of the Hemp T-Shirt” by Caroline Ailanthus takes a look at the role of monks in other religions and speculates on their usefulness and possible manifestations in Pagan culture. “The Charge of the Goddess as Ethical Precept” by Julie Peavler-McCord examines in detail one of the most famous and beloved pieces of Wiccan liturgy. Here we discover evidence that Wicca has every bit as good a set of prescribed virtues as any other religion. “A Hungry Cauldron” by Rev. Helen“Bell” Haughey highlights the commercialization of Pagan paths. 80 pages, originally published in Spring of 2003.